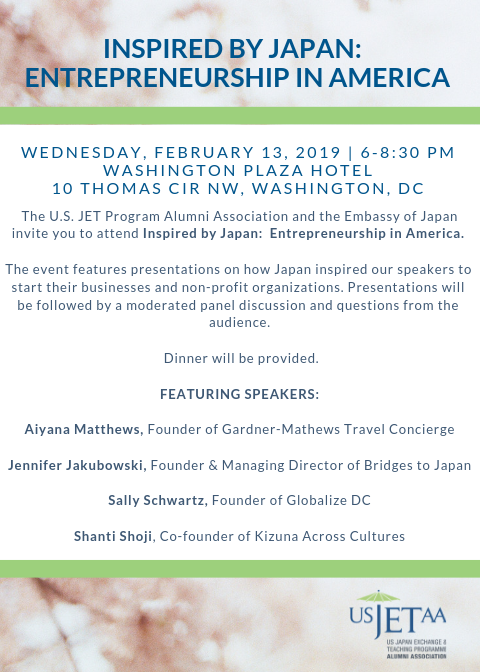 What: The U.S. Japan Exchange and Teaching Programme Alumni Association and the Embassy of Japan invite you to attend Inspired by Japan: Entrepreneurship in America. The event will feature presentations on how Japan inspired our speakers to start their businesses and non-profits. This will be followed by a moderated panel discussion that will explore the broader issue of entrepreneurship in Japan and the United States where we will take question from the audience.